Hiring dipped in the winter but roared back in April to June, averaging 272,000 new jobs monthly. That confirms a bounce after the weak Q1. Six and 12-month average job creation are at their highest in this recovery. With other data also positive, growth is finally building. The U.S. economy added 288,000 jobs in June, the Bureau of Labor Statistics reported on July 3. 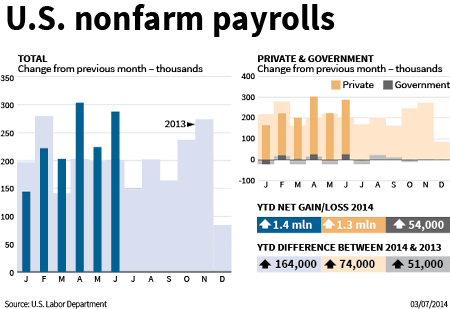 The result puts the three-month average for new hires at 272,000, the highest level since March 2012. The six and 12-month averages, at approximately 231,000 and 208,000 respectively, are the highest since 2006. The unemployment rate edged down to 6.1 percent from 6.3 percent, nearing a six-year low. The labor participation rate was unchanged, as 81,000 additional Americans joined the workforce. The additional jobs were spread across most private sectors, with the service industry adding the lion’s share. Government employment also increased across all segments, federal, state and local.